GeeCON is a great conference with many good presentations. Last year, a talk by Keith Braithwaite on Measuring the Effect of TDD on Design particularly piqued my interest. He talked about Cyclomatic Complexity and that code with tests is more strongly biased towards simpler methods than code without tests. Keith started this interesting research in 2006 and you can read everything about it in a series of blog posts about complexity and test-first. Unfortunately there is no recording of the session Keith gave at GeeCON, but he gave a similar talk at QCon 2008. I will not repeat his research here, so you should read the series of posts or at least watch the recording to continue. 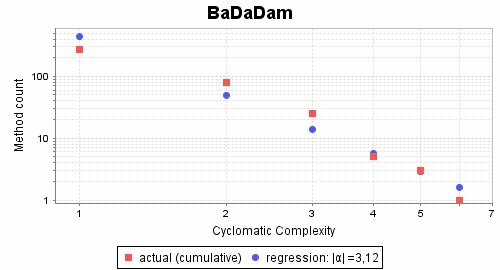 Keith wrote a tool called Measure to harvest the distribution of Cyclomatic Complexity throughout a code base. 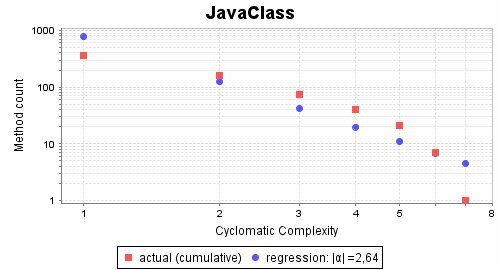 It is based on Checkstyle and analyses Java source code. It worked out of the box, so I gave it a try. 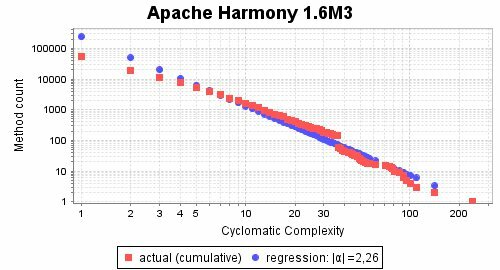 My current project, a large RCP application, has a complexity slope as bad as 1,75. It has really bad code, there are many large and complex methods and no tests at all. (There were no tests when I joined the project last year. Now with me on the project, the number of tests is growing slowly but steadily ;-) I am wondering if the used framework has an impact in the complexity slope as well. RCP is known for its complex dependency structure by its overuse of the singleton patten. Another project that I worked on some years ago was a large web application and it was probably as bad as the current one. After five years of heavy refactoring and retrofitting with unit tests up to 60% code coverage, it scored almost two (1,99). It seems to be a special case. The application was never test-first and as such should score below two. The refactoring activities did not target complexity but were guided by simple metrics and layering rules. If you want to see the complexity slope of your projects download measure-0.3.1.zip and unpack it. It contains everything you need to run Measure. There is a bash for Linux and a I added a batch for Windows. If you run one of them they will print a short help message. I ran it against my little BDD testing framework and it showed me a nice score of almost three (2,94). This was expected as I had used strict TDD while developing it. After my latest refactoring where I reduced the complexity of the story parser considerably, it even scored beyond three (3,12). You can find all the source code at Bitbucket. Note that the scripts are only available for Windows, but the Rake task and Java code work on all platforms. Also note that Saikuro messes up RDOC, so both cannot be in the same Rake file.